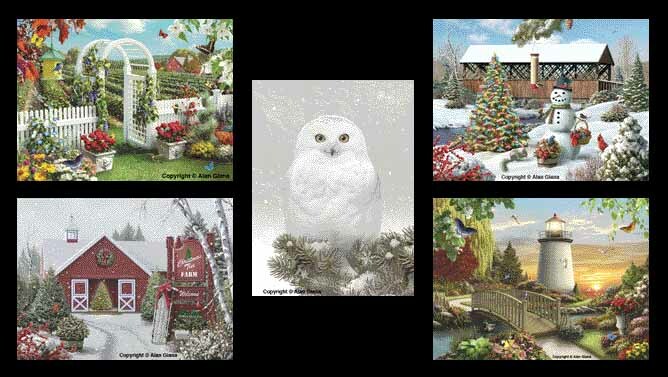 Alan has been busy working on many new paintings that will be available on Christmas cards, puzzles, gift bags, lighted canvas prints and more throughout the coming year. We will provide more information as soon as it is available. In addition to the paintings shown above, Alan has other new paintings on display in the Gallery. A few have never been shown to the public before. Be sure spend a few moments and "Escape to a Peaceful Place". Alan now has over 35,000 followers on Facebook. If you would like to follow Alan on Facebook please CLICK HERE.